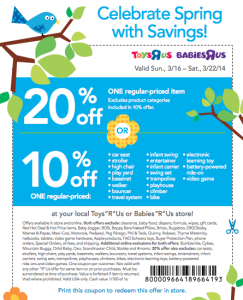 COUPON #1: Toys R Us just released a new coupon for 20% off one item. DVDs are not listed as an exclusion so it looks like you can save an extra $3-$4 with coupon (print it HERE). (I will try it myself and update this post Tuesday.) *Update*- Toys R Us will not accept the coupon on this DVD because it is on sale. The coupon is valid on an regularly priced item. 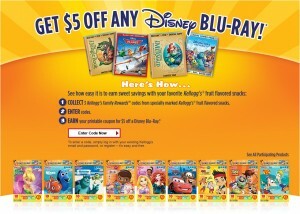 COUPON #2: If you participate in Kellogg’s Rewards and have 3 codes from specially marked packages of Kellogg’s fruit snacks, enter them on the Kellogg’s Rewards site to print a coupon for $5 off any Disney Blu-Ray! 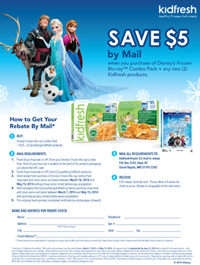 REBATE: KidFresh Frozen Foods is offering a $5 rebate when you buy Frozen and two Kidfresh products (sold at ShopRite in Albany and Four Seasons Natural Foods in Saratoga). Items may be purchased separately 3/18 through 5/15. Find any more deals? Please share! This entry was posted in Capital Region Deals, Coupon, Rebate. Bookmark the permalink.